The Garden Hills Pool has two locations on the pool deck for hosting private functions for groups of up to 30 adults & children. The locations have picnic tables and provide easy access to the swimming pool. Rental of these locations includes the entrance fee for up to 30 guests WHEN RENTED DURING PUBLIC ACCESS HOURS. Garden Hills Pool members may rent the pool deck during MEMBER ONLY HOURS but are required to pay $5 per guest who does not present a valid Garden Hills Pool membership tag when entering the facility. Next to the Pool House Concession Stand on a wooden deck to the East of the swimming pool, the North Deck area provides roughly 400 sq. feet of space with four picnic tables. This area is removed from the flow of traffic near the water and can serve as an outdoor gathering place, ideal for hosting birthday parties, celebrations or picnics. The concrete deck on the South end of the pool farthest from the Pool House and on the West side of the pump house offers roughly 500 sq. feet of space with five picnic tables. The area provides shade for most of the day and is removed from the flow of traffic near the water. This location is convenient to the diving board and is another ideal location for birthday parties, celebrations and picnics. $25 per half hour with a minimum rental of 1 hour. Rental fees include the entrance fee for up to 30 guests when rented at least 24 hours in advance of the event. 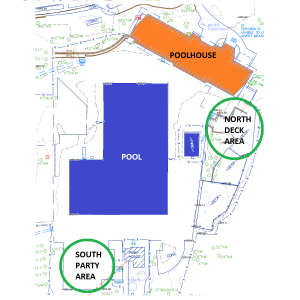 The Pool Deck Party Areas are ONLY AVAILABLE DURING NORMAL POOL HOURS. Garden Hills Pool Members may rent these locations during MEMBER ONLY HOURS at the discretion of Pool Management. RENTAL OF DECK SPACE DOES NOT ALLOW USERS RESERVED SPACE IN THE SWIMMING POOL. Parties renting deck space must share the pool with other patrons.